Check Out Their Respective Websites for Awesome Collections of DXF’s. The Right Collection of DXF’s & STEEL F/X® Patinas & Dyes Will Increase Your Profitability in Plasma-Cutting or Any Metal Finishing Endeavor That You’re Doing! Would You Like to Have These Cowgirls? At No Charge? 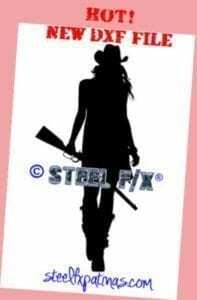 With Any Order of $500.00 or More, Just Add the Note: “Free Cowgirl DXF’s” in Your Checkout Page. I Will Email You a Link for Instant Download of the Files. Remember: It’s “All About the Finish “, Bill Worden, Owner & Fellow Metal Artisan. Highest Quality, Optimized DXF’s From My Personal Collection. No Clean-up Required! 100% Money Back Guarantee! Your Money Back & Keep the Files if Not Satisfied. Optimized for Plasma Cutting in CAD & Ready To Cut! FILES WORK WITH ALL PLASMA-CUTTING SYSTEMS! DXF’s by a Fellow Plasma-Cutter. Check These Out, If You’re Looking for a Few New DXF Files From Me. Would You Like to Have These Cowgirl DXF’s? At No Charge? With Any Order of $500.00 or More, Just Add the Note: “Free Cowgirl DXF’s” in the Comment Section of Your Checkout Page. I Will Email You a Secure Link for Instant Download. SEE INVOICE FOR DOWNLOAD LINK.